A simple sauce that's wonderful with meat, fish or vegetables. It's a sauce everyone should know how to make. Wrap the garlic in foil with a dash of olive oil, then place on a tray in the oven with the tomatoes and chilis. Char the capsicums/peppers over a gas flame until blackened all over (if you don’t have gas you can use a blow torch or just place them in the oven with the other ingredients). Place in a sealed bag or bowl covered in cling film so as to not let the heat escape. Leave to steam for 10-20 minutes. After 20 minutes in the oven, remove the tomatoes, chili and garlic and allow to rest a couple of minutes until cool enough to handle. Remove the skins from the roasted vegetables and also the seeds from the chili, then roughly chop and place in a blender. Fry the bread in a little olive oil until browned. Tear into pieces and add to the blender. Carefully remove the black skin from the capsicum and also any seeds and ribs from the inside. Roughly chop and add to the blender. When the vegetables are cool enough to handle, remove the skins and seeds and discard. Roughly chop the remaining flesh. Roast the almonds in the oven for 3 - 4 minutes until lightly roasted but not coloured. Add to the blender along with the sherry vinegar, salt and pepper. Blend the ingredients until they form a smooth paste and then with the blender running, add the remaining olive oil slowly so that it emulsifies. 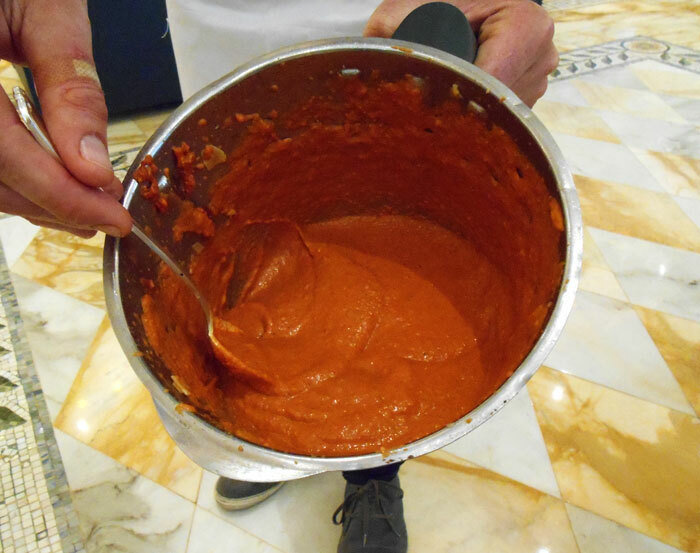 The sauce should be textured and rough, rather than smooth. You can pass it through a fine sieve if desired, but it is typically served as is. Check the seasoning of the sauce and adjust as necessary with salt, pepper and vinegar (or a touch of lemon juice).